Hello and welcome back for another Frightful Fridays! Today's monster is a friendly bear who likes to get up close and personal with its prey, mostly by absorbing prey into its mass and then transforming its future food into a solid chunk of amber. The amber bear could also serve as a plot device to introduce a forgotten critter/horror into your campaign. I hope you enjoy the amber bear, and I'll see you next week with another monster. Thanks for reading! This translucent orange bear seems to have no organs within its mass, but it has several petrified bones floating around. Amber Petrification (Ex) While an amber bear has a creature swallowed whole, the creature must attempt a DC 20 Fortitude save. On the first failure, the victim becomes staggered for 1d4 minutes. On the second failure, the victim becomes immobilized for 1d4 hours. On the third failure, the victim petrifies into a solid piece of amber (as if affected by flesh to stone and requiring similar means to reverse the effect). While an amber bear has a victim swallowed whole, it loses the benefits of compression. The save DC is Constitution-based. Amorphous (Ex) Critical threats against an amber bear still require a confirmation roll. On a confirmed critical hit, or when applying precision damage, the creature encased within the amber bear takes the extra damage. The bear still takes the base damage from the successful hit. Trample (Ex) An amber bear can choose to grapple the first creature it successfully tramples. If it begins its next turn with the creature grappled in this way, it can absorb it into its body as if it used swallow whole. it deals no bite damage when it does so. Vulnerability to Cold (Ex) If an amber bear takes cold damage, it loses the benefits of compression and its amorphous ability (including additional damage dealt to a swallowed creature), and its damage reduction becomes 5/slashing, until the end of its next turn. Amber bears are prehistoric animals that live in primordial woods verging on the primal world of the fey. They share their homes with evolutionary antecedents to many modern animals and throwbacks with no modern equivalents. The bears hunt animals smaller than themselves, but they do not eat them in a conventional manner. Instead, the bears encase their prey in the semisolid amber composing their bodies. This amber eventually petrifies potential food, which the bears regurgitate and feast on later. 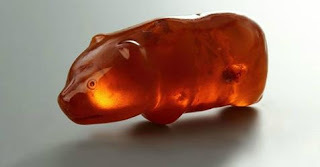 Amber bears require very little in the way of nutrients and feed infrequently, so they often carry petrified victims for weeks or months at a time. Amber bears hate cold and migrate out of temperate forests prior to the onset of wintry weather. If opponents target the bears with spells or effects that deal cold damage, the bears focus their attention on such opponents. Amber bears live up to 30 years, but they can go into extreme forms of hibernation where they completely solidify (becoming statue-like), which extends their lives indefinitely. Fully grown amber bears weigh between 600 and 700 pounds and are 8 feet in length. Welcome once again to another week of Frightful Fridays! This week's monster grew out of a concept my father shared with me, where the monster was a piece of gum stuck under the table. It became this tavern-dwelling blob with an immense fondness for alcohol, including any coursing through the blood of PCs. I hope you enjoy the tavernscourge blob, and I'll see you next week with another monster! This shapeless gray mass, no larger than a typical coin, looks like putty. It smells vaguely of alcohol and the tasteless remains of prechewed food. Agglutinant (Ex) A tavernscourge blob gains a +8 racial modifier to CMB checks to maintain a grapple and to its CMD to resist a creature breaking its grapple. Additionally, it can take a move action to attach small objects (no larger than a coin) to itself; this grants it a +2 armor bonus to AC, but slows its base and climb speeds to 5 feet. Removing an object requires a standard action. Alcohol Drain (Ex) Within a container of alcohol, a tavernscourge blob converts one pint of alcohol into water as it absorbs the alcohol. For each pint it absorbs, it gains 5 temporary hit points (which last for 1 minute). If it absorbs four pints of alcohol, it splits into two tavernscourge blobs, each with half the original blob’s hit points at the time it split. When attached to a creature, it removes the effects of one pint of alcohol from the creature, which must also make a DC 14 Fortitude save or take 1 point of Constitution damage. If the creature has no alcohol in its system, it takes 1 point of Constitution damage and it must make a DC 14 Fortitude save or take an additional point of Constitution damage. For each point of Constitution damage inflicted, the blob gains temporary hit points and splits into two blobs as above. The save DC is Constitution-based. Attach (Ex) When a tavernscourge blob attaches itself to a creature, and until it deals Constitution damage with its alcohol drain ability, the creature only notices the blob with a successful DC 16 Perception check. The check DC is Dexterity-based and includes a +2 racial bonus. Energy Interaction (Ex) A tavernscourge blob is immune to acid, cold, electricity, and fire, but it has unusual reactions to energy types to which it is exposed. If subject to cold damage, it gains a +2 natural armor bonus to AC and its base and climb speeds are reduced to 5 feet. If subject to fire damage, it gains the effects of haste and loses its damage reduction. If subject to electricity damage, its slam attack deals 1d4 points of electricity damage for the following round; if it is attached to a creature at the beginning of its turn, it deals the electricity damage if it maintains its grapple. Sense Alcohol (Ex) A tavernscourge blob can immediately sense the presence of alcohol in closed containers or within creatures in a 60-foot radius as if by scent. This range increases to 300 feet for exposed alcohol. Tavernscourge blobs were alchemical creations meant to scrub alcohol from the bloodstream or from drinks, but their interactions with alcohol awoke a bizarre intelligence and an overwhelming desire for the substance. Their initial attempts to obtain their favorite drink caused them to drain the blood of their victims. They eventually came to a dim understanding that “riding” potential victims to locations with alcohol would prove more rewarding. When they arrived upon travelers at taverns, they hopped off and attached themselves to the underside of tables. There, they could absorb alcohol into their masses in secret, often cleaning up spills created by rowdy drinkers. Tavernscourge blobs are typically content with the amount of alcohol they take in this manner, but occasionally, an overwhelming desire for drink overtakes them and they destroy kegs and kill patrons in their zeal. Worse, the more alcohol they absorb in these frenzies, the more blobs they create, exacerbating the situation. Calmer oozes learn about their establishments’ “regulars,” often so they can attach themselves to outsiders to make trips to other taverns. By plying these oozes with alcohol and working out a way to communicate with them, creatures can gather information about the conversations and goings-on at the locations hosting the oozes. I hope you enjoy the encasing snail. A new monster will be here to greet you next week! This massive snail has a bright pink foot and several mottled-brown shells which fit loosely on its back. The shells rattle as the snail moves. Adhesive (Ex) An encasing snail automatically grapples any creature it hits with its slam attack. Opponents so grappled cannot get free while the snail is alive without removing the adhesive first. A weapon that strikes the snail is stuck fast unless the wielder succeeds on a DC 18 Reflex save. A successful DC 18 Strength check is needed to pry off a stuck weapon. Acid or universal solvent dissolves the adhesive, but the snail can still grapple normally. The snail can dissolve its adhesive as a swift action; the acidic material it uses deals 4d6 acid damage to a grappled creature (DC 18 Reflex for half). The adhesive also breaks down 1 minute after the creature dies. The save and check DCs are Constitution-based. Flexible Tread (Ex) An encasing snail ignores difficult terrain. Shelling (Ex) As a standard action, an encasing snail can fire one of its shells; it can fire a number of shells equal to twice its Constitution modifier (typically 8 times). This attack has a 30-foot range increment and a maximum range of 180 feet. The snail targets the center of a 10-foot-by-10-foot square (AC 5) with this attack. Any creatures fully within the area where the shell lands must succeed on a DC 18 Reflex save or become trapped within the shell; on a successful save, creatures move to a space adjacent to the shell. The shell has AC 17, hardness 5, and 8 hp, and is immune to acid damage. At the beginning of the snail’s turn, creatures trapped within a shell take 3d6 points of acid damage (DC 18 Fortitude for half). The save DCs are Constitution-based. For every 2 shells the snail uses, its DR and resistances are reduced by 5. Additionally, its natural armor bonus to AC is reduced by 1. It also gains a +2 circumstance bonus to its Dexterity (this effectively maintains its AC, but improves its touch AC by 1 and reduces its flat-footed AC by 1). Finally, its base speed increases by 5 feet. An encasing snail can reattach a shell as a full-round action. This restores one of the uses of this ability. Encasing snails were once ordinary specimens that underwent magical and alchemical tinkering to increase their size, improve their adhesive properties, and produce a bizarre method of attack. All encasing snails are carnivores and use their shells to ensnare prey and dissolve it, so the snails can ingest the remaining slurry. Their shells are held together loosely by the same adhesive they secrete from their feet. The snails produce a burst of air which loosens and ejects the outermost shell. They can target a shell’s landing spot with surprising refinement. While they primarily use their launched shells to encase prey, they also use their shells to directly harm foes, usually those who regularly manage to avoid or escape the encasement. An encasing snail measures 12 feet in length, is 8 feet tall, and weighs 450 pounds. A typical specimen lives up to 80 years. The snails’ creators made modifications to the snails to capture rather than destroy prey, as well as to target incorporeal prey or prey with teleportation abilities. Anesthetizing Encasing Snail (CR +0): Anesthetizing encasing snails are identical to ordinary encasing snails, but replace their shells’ acid damage with a numbing poison. Anesthetizing Poison—contact; save Fort DC 18; frequency 1/round for 8 rounds; effect 1d4 Str and 1d4 Dex, and the victim is staggered for 1 round; cure 2 consecutive saves. Ghost Encasing Snail (CR +2): Ghost encasing snails gain the advanced simple template. In addition, incorporeal creatures cannot pass through a shell which has encased them, and creatures within a shell must succeed at a DC 21 caster level check to use teleportation spells or effects to escape the shell. Hello and welcome once again to Frightful Fridays! This week's monster comes with a disclaimer to carefully consider using it against your PCs, since it might ruin friendships. Alternatively, you could use it as a behind-the-scenes manipulator creating messes the PCs have to clean up. The strifemonger demon excels at turning allies against each other and just sits back and watches the mayhem. I hope you enjoy the strifemonger demon. I'll see you next week with another (most likely, nicer) monster. Thanks for reading! A subtle smile creases the lips of this immaculately dressed humanoid with violet skin. A pair of curved horns seem to accent its perfect coiffure. Aura of Treachery (Su) A strifemonger demon’s aura induces distrust among ostensible allies. Creatures that fail their saves are no longer treated as allies to other creatures and can’t provide flanking, use or benefit from teamwork feats or aid another actions, or allow creatures to move through their space. Any spell or effect that requires a willing target fails if used on an affected creature, and even harmless effects require an attack roll, if applicable, and require affected creatures to attempt a saving throw to resist their effects (if a save is allowed). This is a mind-affecting effect, and the save DC is Charisma-based. Like Pawns on a Chessboard (Su) Three times per day as an immediate action, a strifemonger demon can use its hostile juxtaposition spell-like ability. If the demon was subject to an attack, and its target fails the saving throw against hostile juxtaposition, the attack applies to the target. If it successfully uses this ability and remains in the area of effect of a spell or effect, it is still subject to that spell or effect. Instead of using the ability on itself and another target, it can use it on two separate targets; if either target succeeds on the Will save, both targets remain in their original locations. Mindnumb Poison (Ex) Claws—Injury; save Fort DC 20; frequency 1/round for 8 rounds; effect 1d4 Wis; cure 2 consecutive saves. Wisdom Drain (Su) A strifemonger demon’s gore attack inflicts an additional 1d2 points of Wisdom drain on a successful hit (DC 19 Will save negates). On a successful critical hit, the target does not receive a saving throw. The save DC is Charisma-based. When strifemonger demons were mortals, they were gossips, liars, and rabble rousers who sought only to destroy friendships and lives. While their methods seemed to give them a more diabolical slant, their desire to leave emotional and physical wreckage in their wake gave them demonic forms in the afterlife. With an array of preternatural capabilities at the fingertips, they continue to sow discord among mortals, allowing their victims to destroy themselves thanks to petty jealousies or misperceived communications. Strifemonger demons generally work alone but take on brief partnerships with other demons with more subtle techniques at their disposal. Their craft makes them inherently paranoid, and they often dissolve alliances at the merest sign of betrayal. When strifemongers work together, they target two opposing people or groups and incent them to attack each other, usually by exaggerating the conflict between the two targets. They can mask their spellcasting to make it seem like the decision to murder or ruin a foe is their target’s idea. On the battlefield, the demons prefer not to take lives directly and will not use their physical attacks to dispatch opponents, unless their lives are at risk. Their main approach is to inflict their foes with confusion, reducing their foes’ resistance to their spell-like abilities for particularly resistant opponents, and then liberally using hostile juxtaposition to enjoy the ensuing chaos. A typical strifemonger demon stands just under 6 feet tall and weighs 175 pounds, but their ability to change shape means they are rarely encountered in their typical size.